Jackie Zeman before and after plastic surgery. You might recognize miss Jackie Zeman for her long run on the television soap opera General Hospital, playing the role of Barbara Jean "Bobbie" Spence. If you've been following Jackie Zeman's career, you might have noticed that she's made some drastic alterations to her appearance during the last few years. And from the looks of these before and after pictures, Jackie Zeman has undergone a plethora of plastic surgery procedures which appears to include, cheek implants, chin implant, lip injections, botox and breast implants. There have also been rumors that Jackie Zeman had a mini facelift as well. 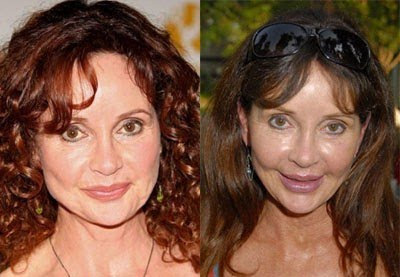 What we have here is a clear case of "witness protection" plastic surgery... Its ok Jackie, you're safe now! Jackie Zeman during her plastic surgery saga.